Tara is a registered nurse with a Masters and PhD. She is currently a Research Fellow at the Mid North Coast Local Health District and an Adjunct Research Fellow at the University of Sydney. 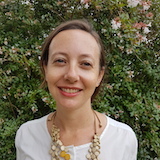 Tara joined the AWCH Board in August 2018.